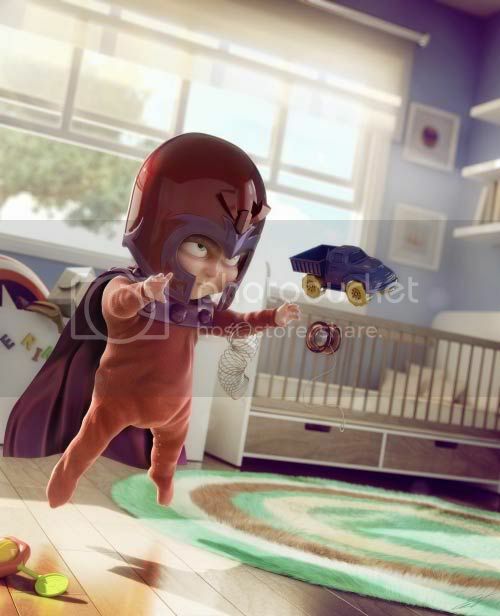 Baby Magneto - No Plastic Toys For This Kid! As Skottie Young is one of my favorite artists of all time I follow him on Twitter and whatever social media or blog he's sharing on like what any self respecting geek would do. One thing that struck me is his profile picture on Twitter a couple of weeks back. 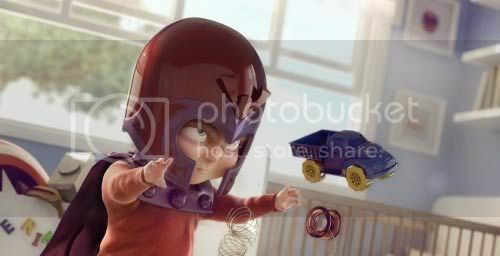 It's actually the image you see above and because I'm really curious as to who or where he got it from I asked him on Twitter but never got a reply. Not surprising as I'm just a fan trying to get his favorite artist to give him a little bit of attention. It may actually have been a good thing because I may have gone into a coma the moment I read his tweet mentioning my name. Anyways, using all my mental powers and Google I finally found the artist responsible for the amazing piece of art, Victor Hugo! He's actually into a lot of Street Fighter stuff so you can probably say I'm already a fan. You can see the whole image after the break if your still interested.